It is an indescribable thrill to sight a moose in the wild. It's happened to me on four occasions, and I remember each one as vividly as if it happened yesterday. Maine's sizable moose population is second only to Alaska's, and many Maine visitors dream of spotting a moose as they're exploring the state. There are ways to increase your odds of seeing a moose, but the truth is, it's a game of patience and of the proverbial "being in the right place at the right time." And when you're vacationing in Maine, particularly if it's a once-in-a-lifetime trip, you may not want to devote hours to hanging around swampy bogs or cruising remote logging roads at dusk and hoping for a lucky break. So, what's a fan of these gangly, hulking, magnificent creatures to do? You can increase your chances of seeing a moose to 100% by including a stop at the Maine Wildlife Park in Gray, Maine, on your itinerary. It's about a half-hour west of Freeport. On this photo tour, you'll meet many of the fascinating, hard-luck wild animals that inhabit this enduring attraction and hear the story of the most enchanting moose encounter of my life. The moose enclosure is the first stop for many visitors to the Maine Wildlife Park, which is open daily from mid-April through November 11. The 40 acres of this 200-acre refuge that are open to the public provide a home for wild animals that have been injured, orphaned or kept as pets. Whenever possible, animals are rehabilitated and released to their natural habitats. "We only keep those that have some sort of condition that keeps them from being viable in the wild," Maine Wildlife Park Superintendent Curt Johnson explained. Those that remain serve a valuable role in educating visitors about Maine's diverse native mammals, birds and fishes. For most visitors, the chance to observe a moose up close is a highlight... even if a fence interferes with photo ops. You don't have to be a journalist, though, to enjoy an unobstructed view. Since 1992, the Maine Wildlife Park has received no state tax dollars: It is a completely self-sufficient operation that relies on admission fees, donations and other creative revenue sources. One of the attraction's inventive programs is the Photographer's Admission Pass. During the summer operating season and even in the winter when the park is closed, professional and amateur photographers can make advance reservations for an exclusive escorted tour of the park that includes the chance to venture inside animal exhibits to shoot unobstructed photos... like this close-up of a cow moose. Typically, Photo Pass tours are timed to coincide with feedings, so moose are up and on the move for photographers, who can capture images from inside the shelter where the moose chow is stored. Since it was a hot June day, and the adult bull and cow had already been fed, they were as docile as cruise ship passengers after an all-you-can-eat buffet, and I was able to venture in for close-ups. If we had seen nothing else, the rare opportunity to view a baby moose would have been worth every penny of the Maine Wildlife Park's admission fee ($7.50 for teens and adults, $5.50 for kids and seniors as of 2018). Orphaned or accidentally separated from his mama, this little guy was spotted running up and down a road in Byron, Maine, by residents, who called game wardens (Ayuh—like the ones on North Woods Law). I don't think my daughter and I have ever said, "Awww!" as constantly as we did while watching this wobbly three-week-old gobble a bottle of warm evaporated milk. He was born this big, we learned. Participate in the Photographer's Pass program at the Maine Wildlife Park, and you can have a memorable encounter with this young moose as he grows and hopefully thrives. Johnson explained the average life expectancy of a moose in captivity is only two years. "Moose are very tricky to raise," he said. "It's hard to simulate their natural diet in captivity." Moose have complex digestive systems, and the quantity and diversity of plants they consume are difficult to supply on a daily basis. And yet, the Maine Wildlife Park has made great strides in providing the best possible chance of survival for moose that cannot be reintroduced to Maine's wilderness. The cow moose—now four years old—had a very similar backstory: She arrived at the Maine Wildlife Park as a young orphan. Once a moose is unafraid of humans, it cannot be set free... both for its own and for people's safety. Moose get "so large," Johnson said, and they "can get angry." And, in typical Maine fashion, he understates: "A blow from a moose isn't good." I wasn't surprised when the bitty moose fearlessly approached the Maine Wildlife Park's knowledgeable and dedicated superintendent, who wears many hats including coordinating the efforts of 150 volunteers who provide 40% of the labor necessary to sustain the facility. I was shocked, though, when the little moose calf bounded straight for me and jumped up on me like a puppy. Of course, he was looking for a bottle of milk, but still. How many humans can say they've snuggled with a three-week-old moose? He was so soft and trusting and curious about my camera. My daughter wanted to take him home. "He will probably live here for the rest of his life," Johnson said. And as he grows, this type of human contact will necessarily cease. I will never forget my unexpected and truly extraordinary moment of interaction with this remarkable animal. A Photographer's Admission Pass is $50 per person per hour during the April through November season as of 2018 (rates are $150 per hour in the winter). It's a small investment for a once-in-a-lifetime experience, and funds raised support the Maine Wildlife Park's mission of caring for non-releasable wild creatures and educating the public about responsible wildlife behavior. My daughter had her own close encounter with one of the tiniest fawns I've ever seen: Two baby deer, also about three weeks old, were sharing the enclosure with the baby moose. Unlike the moose calf, Johnson told us the orphaned fawns have a wonderful chance of being released come spring. They will be transferred to a wildlife rehabilitation facility where they can "wild up" before venturing out into the world. 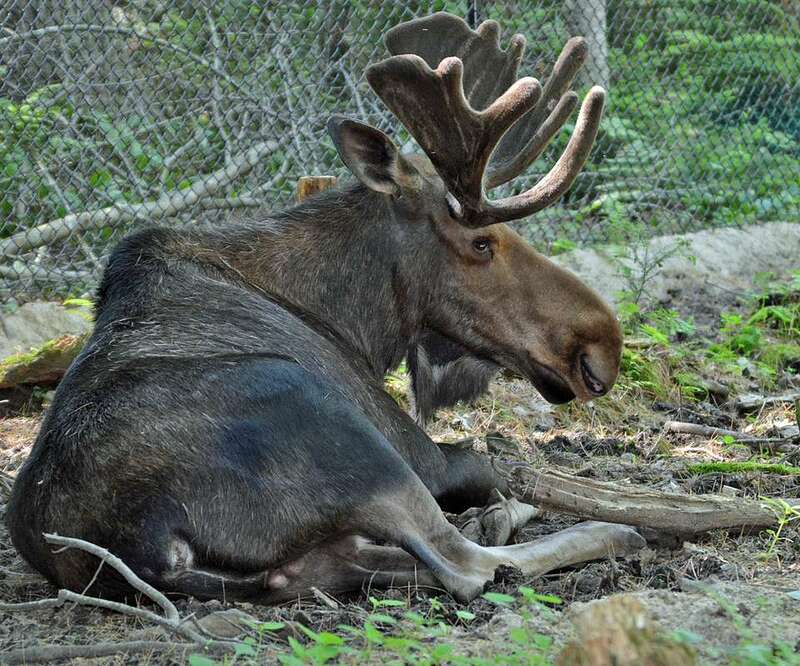 The self-sustaining Maine Wildlife Park continually finds creative ways to boost attendance and revenues, and the more than 100,000 animal fans who visit each year don't come just to see moose! Intriguing creatures abound along the park's 1.66 miles of handicapped-accessible trails. And you don't need to spring for a Photo Pass to capture incredible images. I shot this photo of an albino raccoon by aiming my digital SLR through a gap in the fence enclosure and waiting patiently for the right moment. How rare are albino raccoons? By some reports, only one in a half-million raccoons are born without the pigment that gives a raccoon its distinctive black mask, striped tail and other fur markings. Coyotes and Fishers and Porcupines, Oh My! You would have to devote years—perhaps a lifetime—to exploring the Maine wilds to chance upon the array of critters you can see at the Maine Wildlife Park in a single morning or afternoon. From outside their enclosures, I was able to capture these images of a coyote, a fisher (sometimes called a fisher cat) and a porcupine. You really need to plan your own visit to the Maine Wildlife Park, though, to see how stealthily a coyote glides, learn how sharp and nasty a fisher's canine teeth are and hear how adorable a porcupine's little squeaky grunts sound. The Maine Wildlife Park has a long history of nurturing birdlife. The facility was founded in 1931 as a ringneck pheasant farm under the auspices of the Maine Department of Fish and Wildlife. This large-scale pheasant-raising operation released 30,000 to 40,000 game birds per year. Over the years, the farm also welcomed all kinds of injured and imperiled wildlife brought in by the public, game wardens and biologists. As bird hunting declined in the state, so, too, did the need for the pheasant program, which was terminated in the early 1980s. By then, the property had already become a roadside drive-through attraction visited by thousands of curious Mainers and tourists, so it was a natural transition for it to reinvent itself as a wildlife education center. A peregrine falcon and a bald eagle are among the diverse birds on exhibit. We didn't realize until we chatted with Superintendent Johnson just how lucky we were to be able to observe a stately bald eagle. There are only two places in America where you can see a bald eagle in captivity, he said. Lawrence suffered a broken wing as a chick when he fell from his nest during a severe storm. The wing had to be amputated, leaving the eagle unable to fly and hunt for food. Lawrence plays a symbolic role in the Native American pow wow held each year at the Maine Wildlife Park (August 11 and 12 in 2018). As you enter the Maine Wildlife Park from Route 26 in Gray, you'll see signs cautioning you not to feed the animals. The one exception? You can feed the bears. No, you can't feed them out of your hand. Nor can you share the slice of wild Maine blueberry pie you couldn't finish at Cole Farms Restaurant: a Gray institution since 1952. Bring quarters to buy handfuls of food pellets from a machine, then toss them to the black bears. They seem to appreciate the snacks in a way no petting zoo goat ever did. Even Photo Pass guests aren't allowed in the bears' lair, but they have the option of using a ladder to shoot barrier-free pictures of the Maine Wildlife Park's duo of resident black bears. I was able to capture this photo simply by standing on a bench. Signage at the Maine Wildlife Park is minimal, but here's something cool: You can use your cell phone as you wander around the park to listen to recorded information about each animal exhibit. Just dial: 207-228-1700. The audio tour is free, but your regular cell phone usage fees apply. Wondering how many animals you might be able to photograph and view up-close on a Photo Pass tour at the Maine Wildlife Park? In the hour we spent with Superintendent Curt Johnson, I was able to climb inside the enclosures with two adult moose, a baby moose, two tiny fawns, a lynx, a bobcat and... as a bonus... we got a chance to meet a litter of baby skunks. They were tucked away from public view until they could undergo a delicate operation. I did not know that it is possible to descent a skunk. I approached an 850-pound bull moose fearlessly, but climbing into the cage with the lynx at the Maine Wildlife Park did give me pause. Lynx are only found in four other northern U.S. states besides Maine, and they have massive paws that act like snowshoes as they scramble across snowy landscapes. Superintendent Curt Johnson, who entered the enclosure with me, encouraged me to move closer for an amazing portrait of this big kitty. When I asked Johnson if there was an aspect of the park that visitors overlook, I expected him to name a less photogenic animal... or maybe the adjoining Dry Mills state fish hatchery. Instead, he said: "The bravery of our department is often missed." Established in 1880, the Maine Warden Service is, like the Maine Wildlife Park, a division of the Maine Department of Inland Fisheries and Wildlife. An on-site Warden's Museum contains artifacts from this law enforcement agency's long history. It also honors wardens who have lost their lives protecting public safety and the state's finned, feathered and furry inhabitants. North Woods Law, an Animal Planet reality show, helped raise the profile of Maine game wardens. I stepped inside the bobcat exhibit for my final Photo Pass opportunity... and after hiding in the vegetation for a few moments, this gorgeous cat began to pose. I snapped away, ever mindful that this was no domestic cat. Superintendent Curt Johnson considers the creatures in his care to be "Animal Ambassadors." They teach respect for wild creatures and appreciation for the diversity of wildlife in Maine. Curt Johnson has served as the Maine Wildlife Park's superintendent for 12 years. After majoring in business in college, Johnson was working as a grocery manager when he decided he "wanted to spend more time outside." He returned to school to earn a degree in wildlife ecology, and his combined skills made him the ideal candidate for a job that requires calm in the face of everything from hosting a fundraising benefit to contending with the occasional AWOL animal. A USDA veterinarian is available for consultation, but Johnson said he and his team "have become very self-sufficient with animal care." To what lengths will Johnson go to ensure the financial stability of this treasured attraction? Well... the bear enclosure was once rented for a car commercial shoot: Its resident bruins were lured to star in the spot with honey smeared on the steering wheel! You can help keep the Maine Wildlife Park out of sticky situations when it comes to making ends meet by planning a visit (directions and hours), buying a Summer or Winter Photographer's Admission Pass as a special gift or a treat for yourself, or by making a donation to the Friends of the Maine Wildlife Park. For more information or photo tour reservations, call 207-657-4977. As is common in the travel industry, the writer was provided with complimentary admission for the purpose of reviewing this attraction. While it has not influenced this review, TripSavvy.com believes in full disclosure of potential conflicts of interest.